As part of this year’s March of Dimes Commemorative Coin Program, the United States Mint will be offering a limited edition collector set which includes specially produced Roosevelt Dimes. The program was authorized under Public Law 112-209 to recognize and celebrate the 75th anniversary of the March of Dimes Foundation. Silver dollars with an overall maximum mintage of 500,000 pieces will be issued in proof and uncirculated qualities. 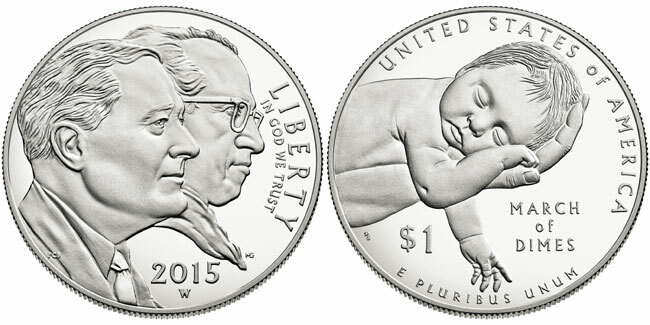 The obverse design of the coin contains profile portraits of Franklin D. Roosevelt and Dr. Jonas Salk and the reverse design depicts a baby cuddled in the hand of a parent. The individual proof and uncirculated versions of the coin are currently scheduled for release on March 13, 2015. 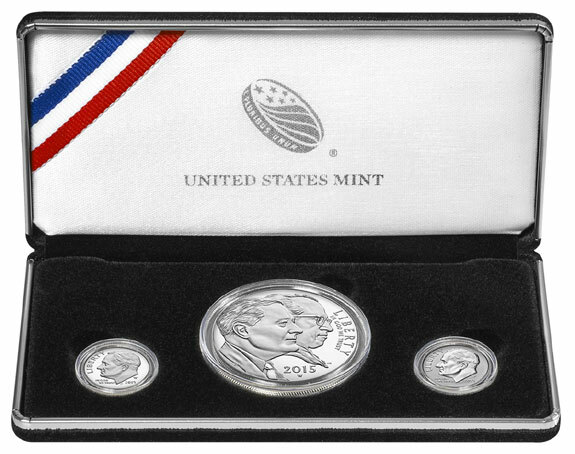 The 2015 March of Dimes Special Silver Set (Product Code DM5) will go on sale on Monday, May 4, 2015 at 12:00 Noon ET. The product will contain the 2015 Proof March of Dimes Silver Dollar, 2015-P Reverse Proof Silver Roosevelt Dime struck at the Philadelphia Mint, and 2015-W Proof Silver Roosevelt Dime struck at the West Point Mint. The coins will be packaged in a plush black clam shell case with silver trim and black cardboard outer box and sleeve. A certificate of authenticity with information about the March of Dimes will also be included. The sets will be priced at $61.95 each. A product limit of 75,000 has been established and an ordering limit of 5 sets per household will be imposed. This is the first time that the United States Mint has produced a silver dime at the West Point Mint and the first time the reverse proof finish has been used on the dime. These two dimes will only be available within the 2015 set. Will there only be 75,000 Roosevelt silver reverse proof and W Mint proof dimes ;combined made ? Based on the information the US Mint has released, there will be 75,000 each of the silver reverse proof and W mint proof dimes. I dont really know why but this set makes me think of the Eunice Kennedy Shriver Special Olympics coin. The set is cheaper than the Gold JFK Half but will it be any easier to sell? Highly doubtful. This is a set for ever hopeful flippers and the few Roosevelt Dime fans out there. I cant really see much secondary demand for this set. The regular Proof sets carry the S mint as they are produced in San Francisco. These both will be different; will they have the same secondary market as the 1998 Matte Kennedy half or the 1994 and especially 1997 Matte Jefferson nickels? Perhaps. Looking at the cost, each dime will carry an individual price of $5 since by the time the set is released the Proof dollar will carry a price of $51.95 and the set will be $61.95. This set is a no brainier. Two unique dimes with a mintage of only 75k. It is a gift from the mint to the modern day coin collector. The set will sell out very fast and the dimes will quickly sell for at least 30 dollars each ungraded. Here is my thought process on this. It’s an established long running series with nothing of real interest in it other than the 1996 w with a mintage of almost 1.5 million and they sell for 15 bucks. If you collect roosevelts than this is a must have. Secondly each coin is priced at 5 dollars, a nice profit for the mint and a nice inexpensive key coin for us. Trust me people you can not loose money on this mint offering. As far as the dollar is concerned I think it is a dud and needed this extra packaging to sell an extra 75k dollars, actually a wise move by the mint. The 2 dimes will be the rarest of all Roosevelt Dimes. They are already pre selling these sets on ebay for $100 and higher. Many Roosevelt Dimes collectors will be out of luck and unable to have a complete set. Just like the mint marked silver eagles. Unless one has the 2011 S silver eagle, or the reverse of 07 / 2008 W silver eagle, they cannot have the complete set. These dimes could hit $100 a piece. Considering the mintage, they could even go to $300 or higher. I have herd doubt the collectability of the two unique dimes in this set who have stated they don’t believe there are enough dime collectors to eat 75k. To that I say you may be right but these dimes have a cross over appeal to proof collectors and reverse proof collectors that should make them scarce in short order. Considering the silver proof production of the S counterpart sold areound400k in 2013 one should apply a 1 to 5 market demand that can not be meet if they want to complete a full set. Sure, I know, some people hold multiple sets as investments and no 400k people don’t all have one proof set each but those same people who buy multiple sets will buy multiple sets of these. At $5 a coin you can’t go wrong. I will likely buy 5 and sell off the dollars, no interest at all for me, and hold the dimes for a while and see what they hit before I sell my extras and keep two for me. I imagine many will pay more for the dimes alone then pay for the dollar they don’t want. I think I am going to piece my sets out on E-bay. I have seen the two dimes sell for $75 because people don’t want the dollar and would rather pay $75 for dimes then $95 for set. I will put the dollars at auction and likely make more then trying to put the dollar off on folks who have no interest in them. I just looked over my coins and one of my reverse proof dimes is struck thru. It is on the reveres in the field. It is situated between the A and M in America and the closest leaf to them, like in a triangle made of the 3 points I mention. It’s size is about 1 third the total distance between the M and leaf and it is somewhat tear drop shaped under magnification. I thought it was a spot on the coin at first but it is struck thru. Anyone have an opinion as to what this may do to the value of the coin?